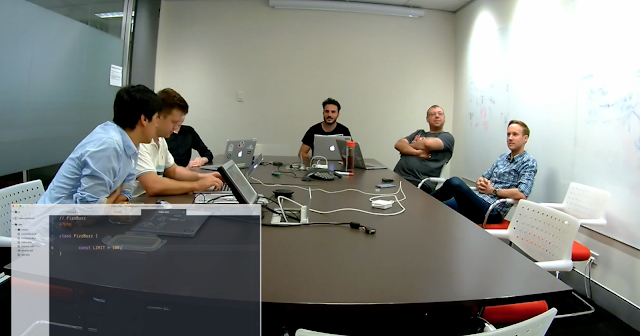 Mob programming has been gathering more and more momentum over the last 6-12 months so we decided to experiment with it in some of our software development teams at NewsCorp Australia. So what exactly is Mob Programming? How often do specific developers in a team only understand certain aspects of the code? And while code reviews are a great collaboration technique, sometimes you need more. Mob programming is a great technique to solve technical problems together as a team, allowing everyone's input to be voiced. As a positive side affect it can also help to encourage pair programming within a development team. So how did mob programming go in NewsCorp? Like anything you rarely find success by forcing a particular practice onto a team, it needs to adopted by a team naturally if they see it really adds value. We started by simply running a few exercises with a few of our front-end and back-end development teams to experiment on how mob programming could work within our business. Opening remarks started with, "ahh Fizzbuzz, this should be easy", and "I'm not sure how I feel about people watching me code". It started off fast as the first person to drive took the laptop and started coding.. until... the team quickly pointed out, they have to listen to the navigators. This is when everything slowed down and everyone started discussing, "do we do unit tests first", "can we re-read the instructions in the readme", and "this is harder than you think when we all have to do it together". By the end of the first round, the team had created the start of the "FizzBuzz" method. By the end of the second round the basic FizzBuzz method was complete. Seeing the team started with the core functionality, at the start of round 3, questions were being raised about starting unit tests, and how they were going to test this functionality. By the end of round 3, we had an initial unit test that tested the basic 'FizzBuzz' was outputting correctly. Round 4 and 5 saw a wider set of unit tests being created to test the validity of Fizz, Buzz and FizzBuzz outputs. There was some refactoring of the FizzBuzz application, as well as some cleanup to the unit tests to improve coverage. By the last 2 rounds the team focused on outputting all of the numbers from 1-100 in the console. Challenge complete! The team started off slow in giving directions, well, in the way the driver understood the instructions being given. It took a few rounds for the team members to be talking the same language. After this, all someone had to say was, "created a unit test", "copy that function and past it there", "rename this to that". As expected, there were the more confident developers navigating more than others at the start, but when it was their turn they immediately became the listeners, which gave an opportunity for other developers to voice up. The mood was also really positive. At the start people were saying, "oh now everyone sees how I code in real time", but by the end everyone realized their peers were quite open and not judgemental. This session had 5 developers, all taking part in the same FizzBuzz challenge (but in PHP). As before, each developer was driving for a single 3 minute interval, however we went around 2 rotations. Opening remarks started with, "ok, lets see how this goes"
Team was keen to get started quickly and smashed through most of the requirements in about 2-3 rounds. These rounds saw the team work closely on unit testing to get confidence in the core code that was developed. A lot of discussion around correct architecture also took place, when the team decided what and how to refactor. Within the last 3 rounds, the team rapidly implemented refactoring to allow better unit testing of the implementation of FizzBuzz. Withing 3 rounds the application was done. It was a quick MVP to get the basics in place. This development team had been working together for over 12 months so they knew how to work with each other very well. The team took the approach of fleshing out an MVP, then adding unit tests, then refactoring the application to improve scalability. Why did they not do unit testing first? This is a team that has thousands of unit tests around their current code base, and there is a culture that code never reaches production without unit tests. To them, getting a quick MVP with the understanding that unit tests will be there for release is already well accepted. What the team did uncover, was using sessions like this to flesh out complex features together could really speed up the overall delivery of a future feature. Currently code reviews are heavily used in this team, and this is when potential issues in design decisions are picked up. But having a 1-2 hour session to mob out the basic architecture of a new feature could really reduce feedback in code review process. What's next? Will we keep mob programming? This is up for each team to decide... I believe we all agree, sessions like this can be great to get an entire team over a single concept or feature, or to architect a new application with everyones input right from the start. It was definitely a fun exercise that we will keep experimenting with. Symfony2 logging application errors to a database table.